Reports reaching sabi-talk say Boko Haram militants have taken over the highway linking Maiduguri and Damaturu, capitals of Borno and Yobe states respectively. 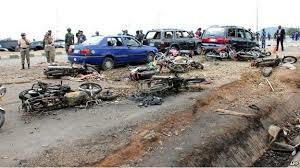 A police officer stationed in one of the villages along the highway, told sabi-talk that travellers are being asked to return as the terrorists have taken over the road between Benisheik (a town 85km away from Maiduguri) and Ngamdu (35km away from Damaturu). There is no security checkpoint between Benisheik and Ngamdu, which is about 25km stretch of road.